This Instagram campaign has garnered over 600,000 likes so far while most of their posts collect up to 100,000 likes. 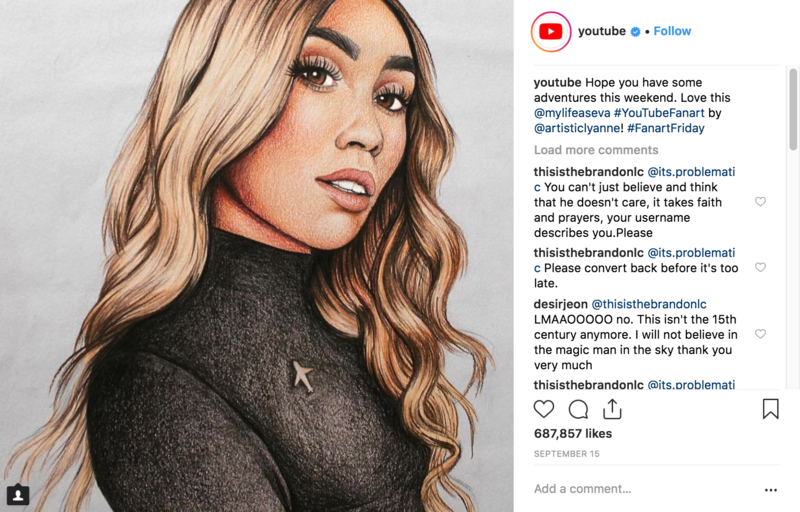 YouTube’s perfect blend of user-generated content, influencer marketing, and community building is the reason behind its incredible reach. The takeaway for marketers: Create a hashtag your audience can use to engage with your brand. When the posts start to trickle in regularly, feature it on a consistent basis, such as weekly or biweekly to increase your reach. Ever wondered how to make the most out of events that are trending worldwide, even if they’re not in your industry? Learn from Lego, because this is exactly what they did for the royal wedding in May of 2018. 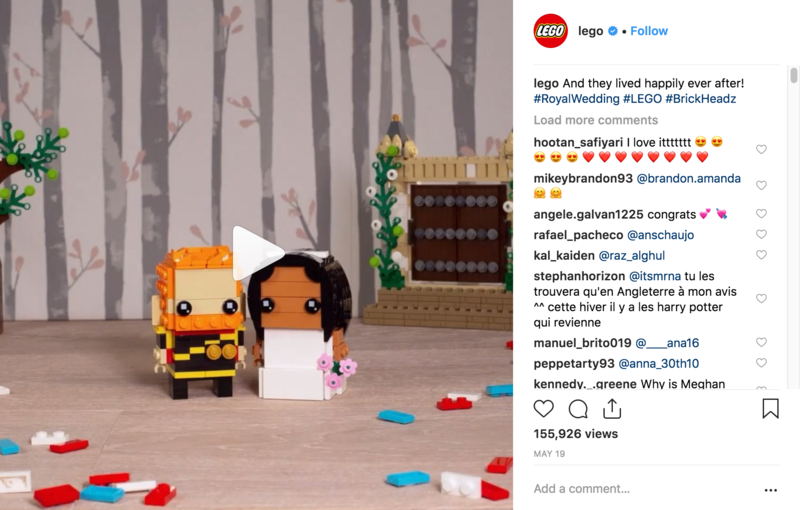 Even though they’re not a wedding company, they took the chance to share a relevant video—one of the royal wedding with characters that were created using Lego blocks. This campaign increased Lego’s reach thanks to the trending #RoyalWedding hashtag, garnering over 100,000 views and almost 400 comments. The takeaway for marketers: Jump onto current worldwide trends by creating relevant visuals with your products if it’s appropriate. Lego does the same with Halloween and other events, so keep an eye on different types of events that are coming up. Athleta is a yoga and athletic clothing brand. Their Instagram strategy is focused on imagery that empowers women of all shapes and sizes and they run contests on a regular basis. One of their most successful Instagram campaigns is the giveaway they ran on #NationalBestFriendDay on June 8th. They knew this will them an extra push in reach compared to posting to their regular audience. They used a perfect image for the occasion, and the prize was tailored to two people, too. This campaign attracted over 2X likes and about 40X (!) times more comments than usual. The takeaway for marketers: Tailor your giveaways to the specific social media holidays that align with the audience you’re targeting and your brand’s overall tone and focus. Fitness is an incredibly competitive space on Instagram. To stand out easily, you can manage your hashtags and create hashtags groups within Sked. When you sell items that people only buy once or twice in a decade, you know you need a good brand awareness strategy that will help spread the word effectively. Casper, a mattress and nighttime accessories company, wanted to reach people who love a good pillow fight. To achieve this, they launched an internet pillow fight website that does exactly what it says in the name: it lets you smack other internet users with a virtual pillow. 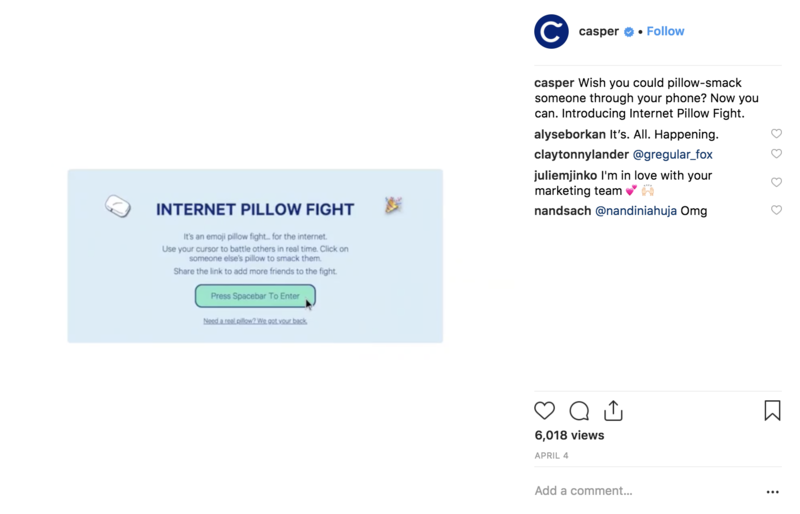 They used three consecutive videos to promote the website on Instagram by showing the internet pillow fight in action. The immediate result? People tagged their friends and visited the pillow fight website. Long-term result? Casper nurtured the relationship with their existing customers and likely attracted new ones by playfully bringing awareness to their line of mattresses and pillows. The takeaway for marketers: If you sell products that don’t need to be repurchased for years, think of a fun and relevant way to become top of mind with existing customers who will gladly share your brand with their friends. These individuals will likely be shopping for your products at a later date, and place more trust in the recommendations that come from people they know. The Worldwide Breast Cancer Organization is dedicated to educating women around the world about breast cancer. While lots of medical jargon typically goes in breast cancer awareness, the organization wanted to spread knowledge about signs of breast cancer without too much text or any unpleasant images. They achieved this by designing an image illustrating the twelve signs of breast cancer. The image shows 12 lemons in an egg carton, each depicting a different sign. It spread like wildfire over social media and has taught women and men how to easily recognize the 12 most common breast cancer symptoms. 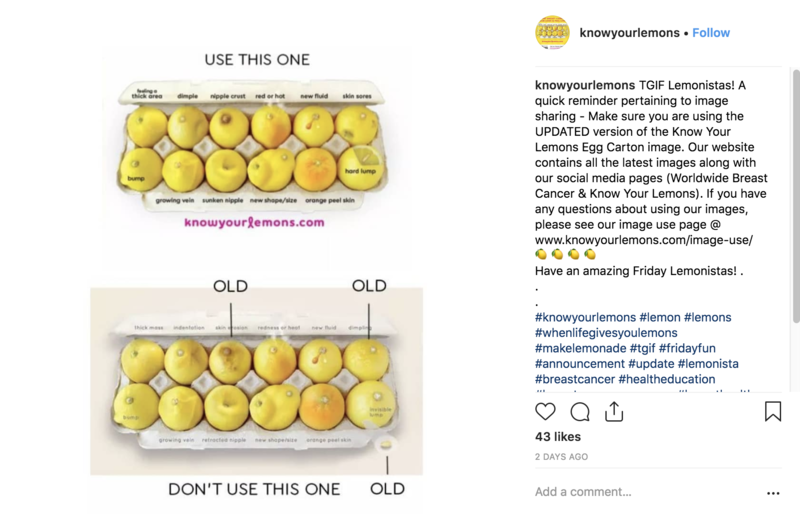 It used a distinct hashtag, #KnowYourLemons, and inspired the world to break the taboo and fear of this disease. They have shared this image throughout the entire year in multiple languages and variations, as well as an updated image with correct symptoms. The takeaway for marketers: When you’re promoting something that isn’t visually appealing or is technically complex, look for visual alternatives to help you communicate more effectively. This will help you make your Instagram campaign more engaging and memorable. Nike’s footwear technology is among the best in the world, and the same can be said about their social media strategy. Nike teased the launch of their React running shoe with a visual break down of the shoe in their Instagram campaign. The initial teaser pictured the foot of a mannequin set on a stack of sponges, pillows, and springs, hinting at the comfort to come. Nike’s caption answered the user’s curiosity by confirming the launch of a new running shoe and announcing its launch date. The next post in this Instagram campaign was a video of the shoe that also introduced its name. With almost 7 million views, it is the most viewed Nike’s video in 2018. 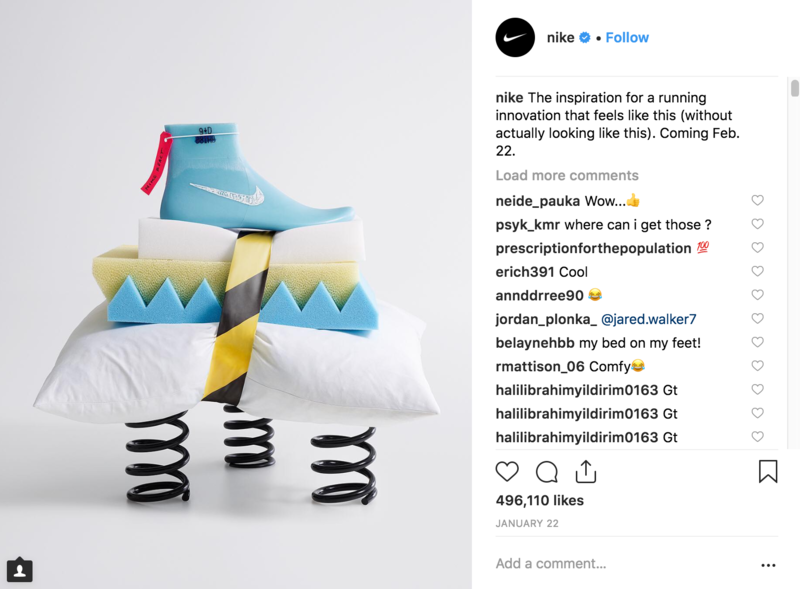 The takeaway for marketers: Break down your products into compelling and digestible parts (for Nike, this was softness and lightness of a running shoe) and use this to create an Instagram campaign that captures the essence of the product without having to explain the details. As the name implies, Rent the Runway lets you rent designer clothing and accessories. As you’d expect, their Instagram feed is packed with their latest styles and well-dressed people. 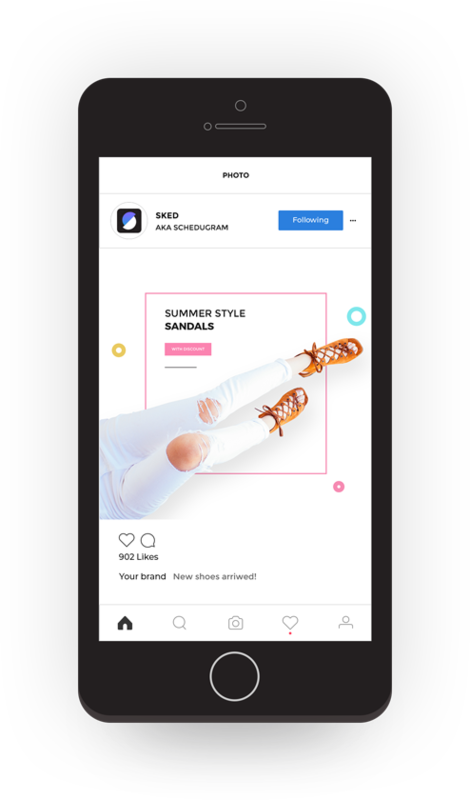 For a company like Rent the Runway, announcements like new app features can be a tricky move to make. Technical updates feel like an unwelcome distraction in a stream of visually appealing outfit images. 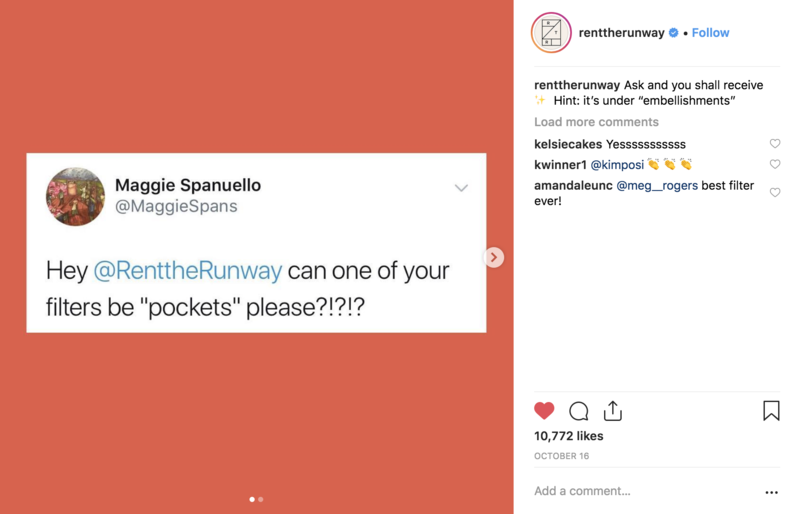 Rent the Runway has cleverly announced their new feature—filtering clothes by whether they have pockets—with a screenshot of a customer’s tweet that asked for that feature. They added a short caption to explain where it is, and that’s it. The takeaway for marketers: This announcement wasn’t just creative—it proved that Rent the Runway genuinely cares about their customer’s needs. Look at the roadmap of your upcoming product and company updates and see if you can use customer feedback to announce them. Vans’ Instagram account is easily recognizable thanks to the unique look of their shoes. 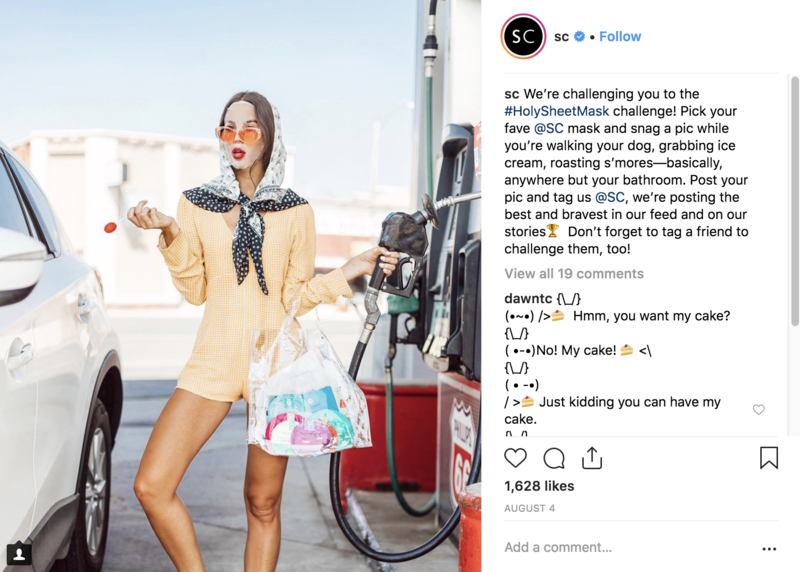 However, one of their most successful Instagram campaigns occurred when they tapped into the deep connection their customers have with Marvel. To announce their Marvel collection, they shared a simple, vintage-looking animated image of Marvel’s Spider-Man gliding across the screen. 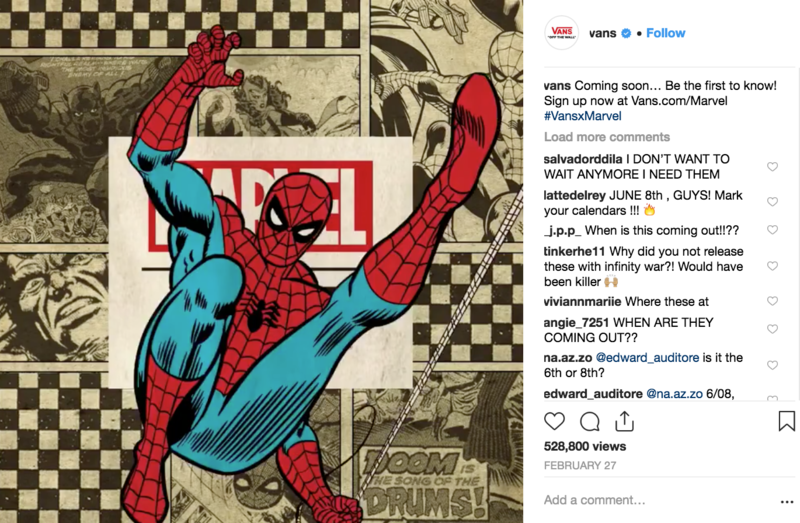 This significantly stood out from their typical feed, so they successfully drove traffic to the page with updates and to the #VansxMarvel hashtag, which is still used by dozens of Instagram users daily. This Instagram campaign succeeded because Vans clearly knows their target audience well—you can see hundreds of comments from people impatiently waiting for the collection to come to life. The takeaway for marketers: Tap into the many layers of the people who support your brand. Look for topics, industries, entertainment, and other areas they are interested in. Identify the most relevant ones and weave them into your product and marketing strategy. MVMT, a brand that sells watches and fashion accessories, has mastered the cohesive Instagram feed thanks to beautiful photography. However, when introducing a new product on Instagram this brings about a new challenge since there’s a risk it will blend it with the rest of the photos. 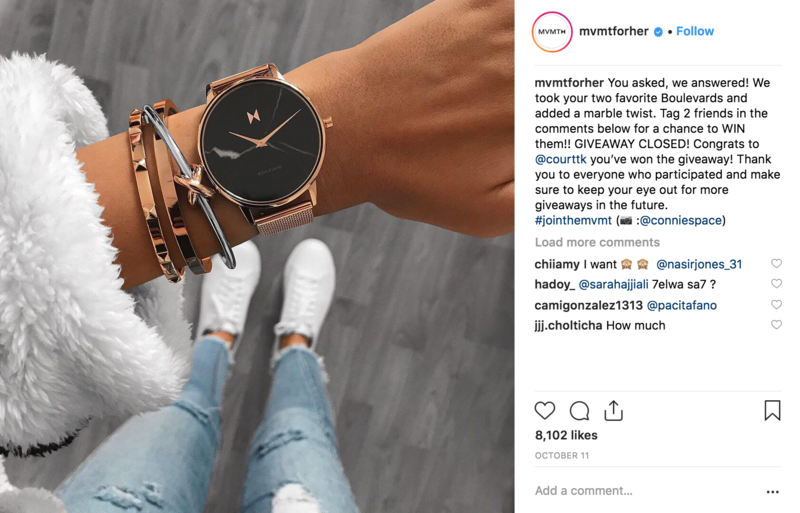 Which is why MVMT launched a new version of their Boulevard watch in conjunction with a giveaway. The photo perfectly suited their feed, but the giveaway gave it the boost it needed, amassing almost 4 times more likes than usual and getting over 900 people to participate. 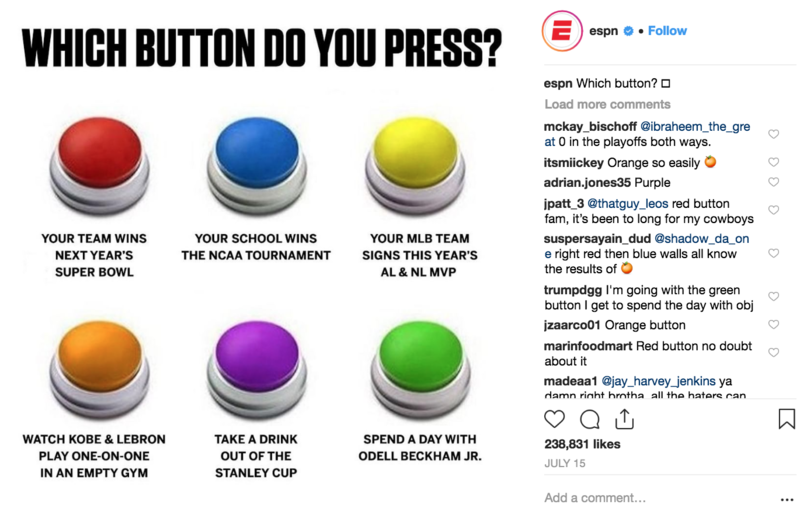 Because of the contest’s tagging requirement, this Instagram campaign garnered around 80 times more comments than usual, which gave it a significant boost and likely pushed it to the Explore page. As a bonus, this extra reach encouraged those that don’t usually comment to share their positive experiences with the brand. The takeaway for marketers: Launch your next product by running a giveaway first, before promoting it as a new item your audience can purchase. Furthermore, you can tag your products within the Instagram post for easy purchase after the giveaway is over and sufficient buzz around the product has been generated. Want to spark conversations about your product? Challenge your customers to use it in situations that aren’t obvious. The Sephora Collection account did just that with their #HolySheetMask challenge. Not only did they get their customers to wear sheet their masks in public, but also challenged them to take pictures and share funny stories. With over 500 submitted photos through the hashtag, both large and small accounts took part in the challenge. Sephora Collection reposted many of the submission on a daily basis, supporting their ongoing face mask promotion. The takeaway for marketers: Get your customers to share their love for your products in an entertaining way along with a unique hashtag. If your budget allows it, partner with a few influencers to spread the word about your challenge. Beauty Blender is one of those companies that has revolutionized their industry. Their beauty sponges were the first makeup tool of their kind on the market, and many makeup brands subsequently came out with their own versions. When launching their first ever line of foundations in 2018, Beauty Blender leveraged their market leading position to launch new products. The key message of this Instagram campaign was that some things naturally go together—like avocado and toast or champagne and orange juice. This hinted to followers that something juicy and perfectly paired with a beauty sponge was about to come their way. 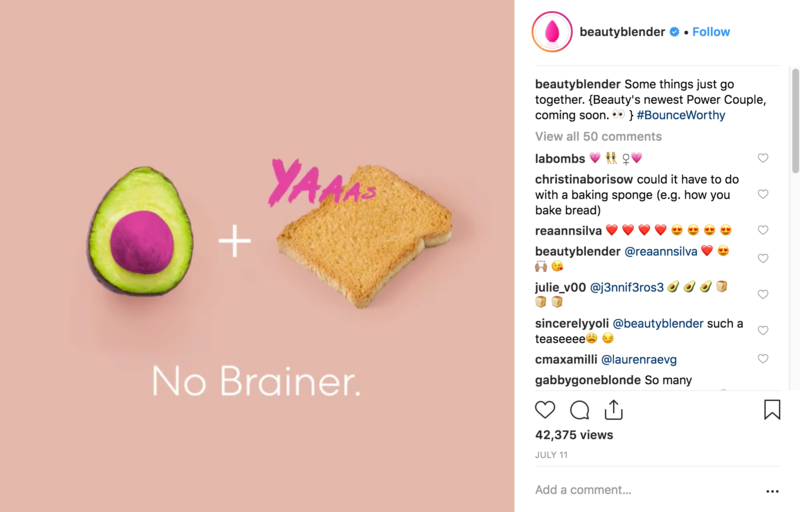 Beauty Blender teased the product for an entire week, which lead to many of their followers guessing what the product was, and almost 1 million views on their announcement video on Instagram. The takeaway for marketers: Use what you are best known to tease a new product launch. Make sure you’re using messages and examples that relate to your audience demographics; in the case of Beauty Blender, these were emojis and pop culture references. Successful Instagram campaigns aren’t just those that successfully promote a product. IBM’s Pride Month campaign is proof. The computer company makes a special effort to share what they’re committed to as a company, so during LGBT Pride Month, they changed their logo into pride colors and wrote how they promote diversity and inclusion in the company. 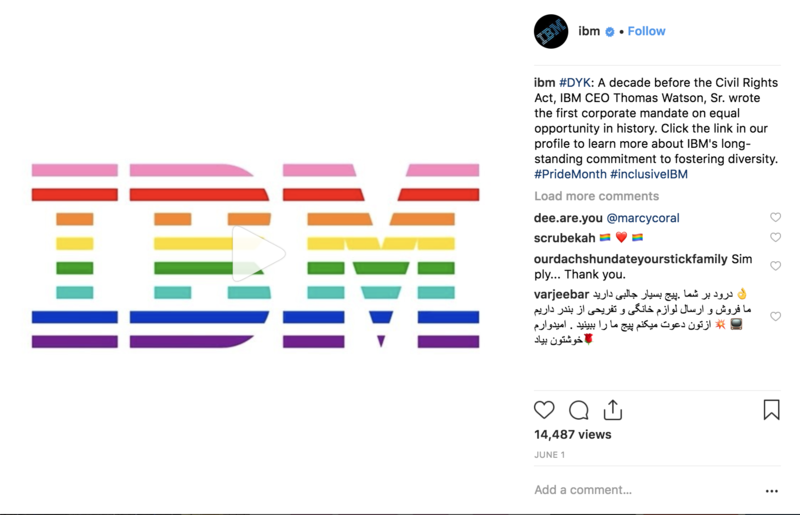 Along with changing their profile picture to reflect this, they shared two separate posts with the animated pride-colored logo and created the #inclusiveIBM hashtag, which has been included in almost 1,000 Instagram posts by IBM employees and supporters. The #PrideMonth hashtag helped them gain additional reach as the monthly celebration was just kicking off. The takeaway for marketers: Make an effort to showcase the efforts of your company to make a difference in your community and in the world. 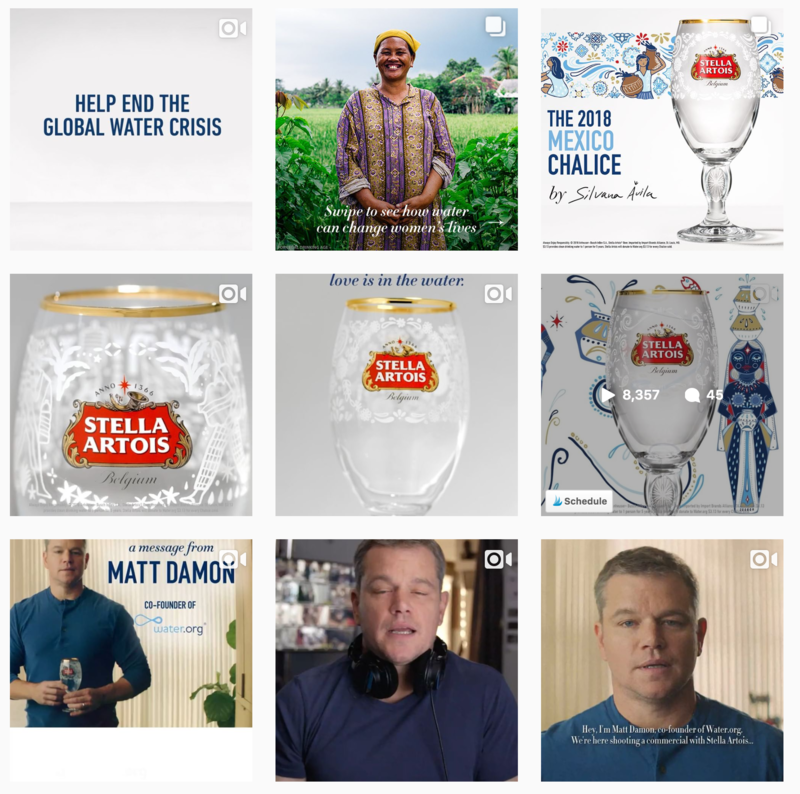 With this type of Instagram campaign, you can build trust and genuine relationships with your audience by simply sharing what you stand for. Adobe is a suite of software solutions for creatives. Unlike physical products you can hold or wear, you can’t quite take a picture software and make it look anything other than dull. 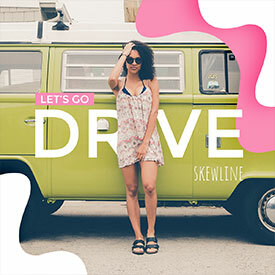 Adobe found a brilliant solution to this problem: themed user-generated content. 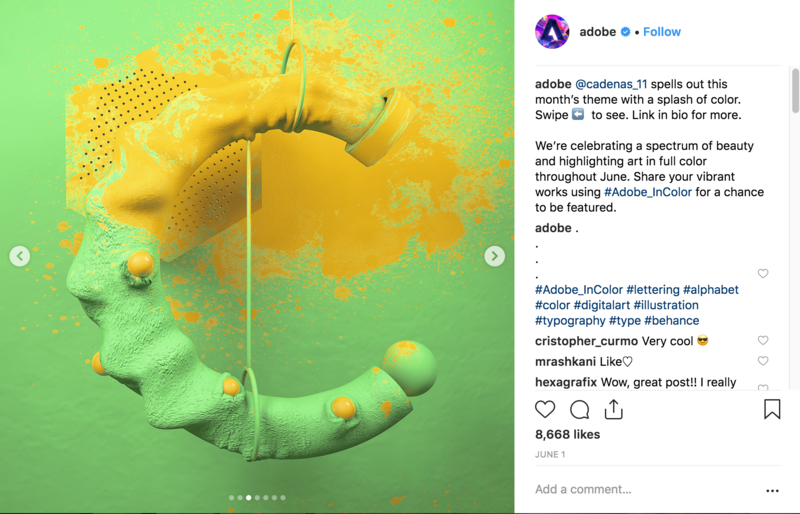 Their entire feed is made of monthly Instagram campaigns that feature stunning artwork made by their customers. The takeaway for marketers: Share the story of your product by showcasing its outcomes. Introduce weekly or monthly themes to easily brainstorm new ideas. This campaign can work as a user-generated content campaign or with your original content, too! Citrix Workspace is a digital solution that enables users to access their apps, desktops, and data wherever they are. The target audience for this product includes companies who want to move their processes onto the cloud. Not quite an Instagrammable product or audience. 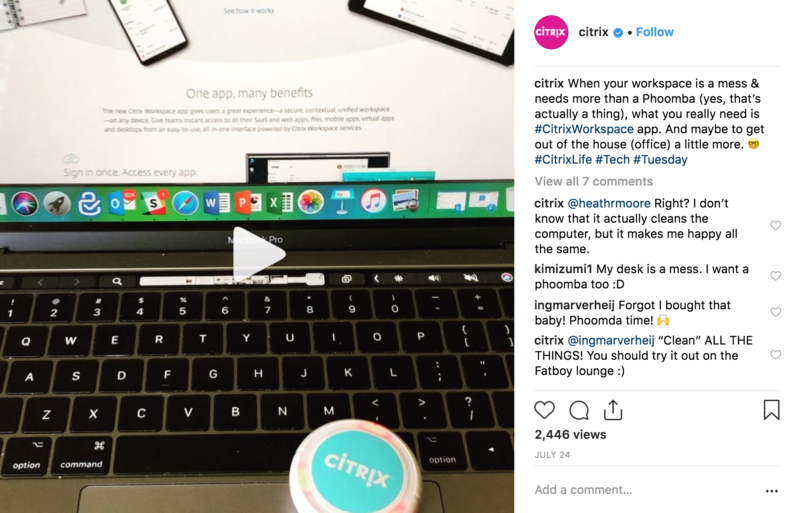 However, they successfully promote their solutions with a #CitrixWorkspace hashtag and a little creativity. The takeaway for marketers: No matter how technical your product might seem, there’s a chance you can translate it into an everyday situation and make someone laugh along the way. Take note of any such references your coworkers or even customers make and turn it into a campaign idea. Cultivate What Matters is a shop with planners and accessories for setting purposeful goals. Even though they have several product launches throughout the year, their main one happens each October as they launch Powersheets, their key product line for the upcoming year. They’ve also used their standard #Powersheets hashtag along with #PowersheetsAreComing to build more buzz and bring their community of goal-getters together. The takeaway for marketers: Use the week leading up to your product launch to create excitement around what’s coming. Share sneak peeks of your new product, get your customers or beta testers to share their experiences, and show the passion of people working on the launch. With Sked, you can plan and launch your campaigns stress-free across Instagram, Facebook, Pinterest and (soon) Twitter. Schedule all your launch week posts in advance—Sked will automatically post them for you! You can run campaigns on Facebook and Instagram together using our platform. 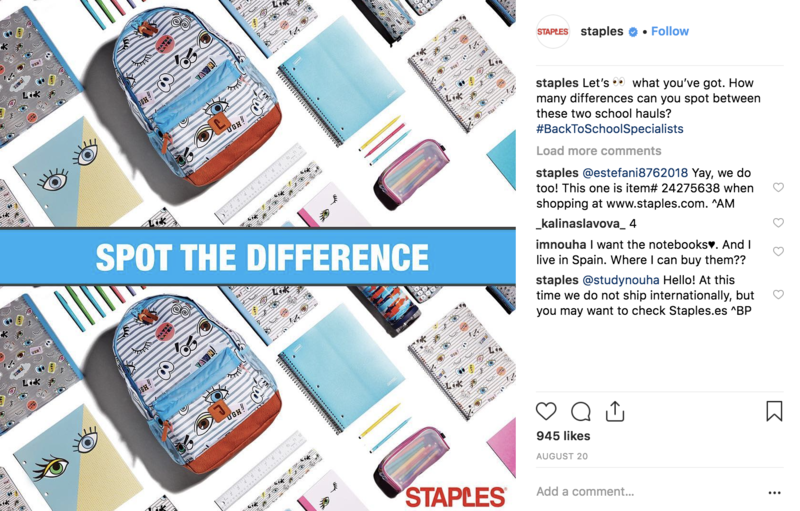 As a stationery supplier, Staples has to make sure they’re the most visible at specific times of the year, and the back-to-school season is one of them. Even though they have over 60,000 followers, their posts often receive around 200 likes and a dozen comments. 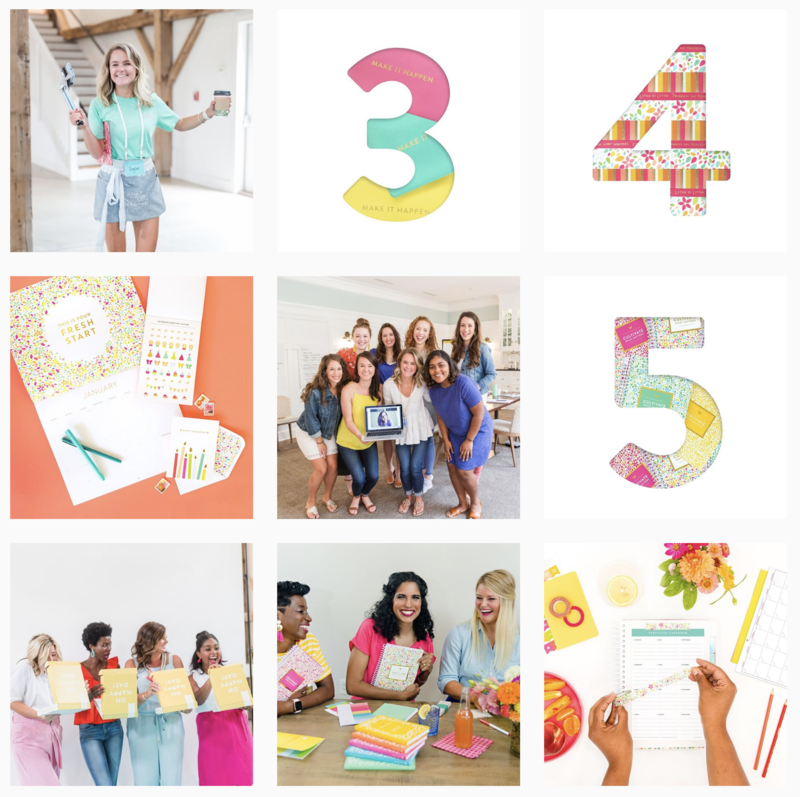 To increase their reach during back-to-school season, they created a #BackToSchoolSpecialists Instagram campaign that is both topical and engaging. The takeaway for marketers: Brainstorm engagement boosters that will work for your brand and industry. A quiz like this one works for back-to-schoolers and their parents, but it might not for you. Tagging friends, answering a simple question or a poll are other great ideas you can try. 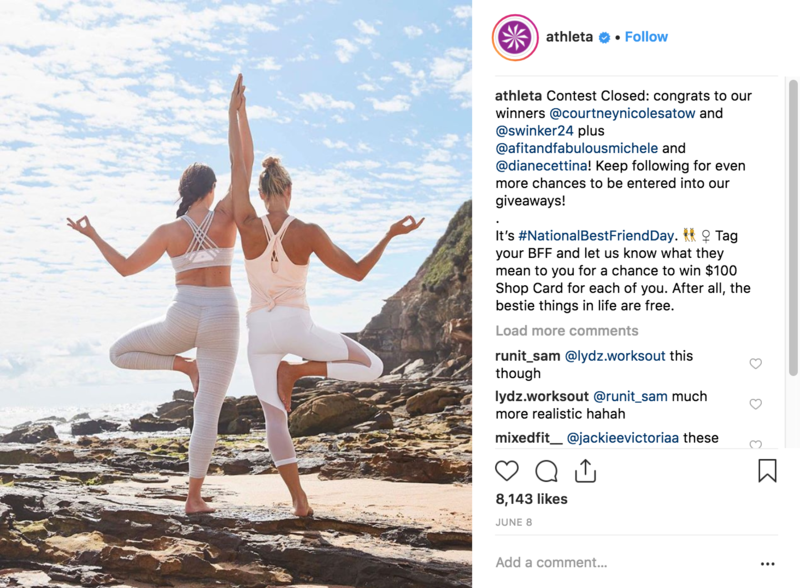 The best Instagram campaigns aren’t just those that drive engagement, but also the ones that help you grow a loyal audience and repeat customers. Marijana is a freelance writer and content strategist for SaaS and marketing brands.